When we made ‘Moonrise Kingdom’, Wes, Roman, Jason, Bill Murray and I all shared a big old house in Newport. It was about as fun as it gets. Like making home movies with your friends in middle school, except it ends up Opening Night at Cannes. We didn’t want it to end so after the premiere we went to Italy for a hang and we’ve kept it up. ‘Grand Budapest’ got handed out for a read the first summer and ‘Isle of Dogs’ was outlined the next. Bill wasn’t with us this summer but we wore his #WilliamMurrayGolf shirts to infuse the idyll with his spirit of fun. And #BMW loaned us incredible rides to get the growing families over the dusty bumpy Tuscan roads to gelato at the town on the hill. If I had to get stranded with a group on an island, I could make it work with these cats. The importance of the books, of the narrators, of the narrative, in the movies made by Wes Anderson are exploded in this beautiful video made by the people from The A to Z Review. Enjoy! A new video by UCB Comedy for Characters Welcome. If you ask me, the best part is when he sings a Spanish version of John Lennon’s “Oh Yoko”. She is a Greek-American living in Paris for 8 years, addicted to stinky cheese, bicycles, and boys with freckles. He is a French computer nerd that can recite all NBA and soccer statistics from 1950 onwards. In 2010, they met on OkCupid. Both fans of movies and fonts, there was an instant connection with each other, and with Wes Anderson. Fast forward to 2014. They danced on the banks of the Seine River to Françoise Hardy. And they will dance down the aisle in August. They are each other’s grandest adventure. From July 12 to August 31, the Northwest Film Center in Portland will present “Wes’s World: Wes Anderson and His Influences”, an opportunity to know not only his work, but the films who has inspired him along his whole career. “Wes’s World” will also include showings of films by François Truffaut, Jacques Cousteau, Werner Herzog, Jean Renoir and Hal Ashby, among others. Check out the program’s trailer below. The full lineup can be found here, on the Northwest Film Center’s website. Wes and co. had a good night last night in New York at the IFP Gotham Awards. Moonrise Kingdom took home the top prize of the evening, the Best Feature award, which was accepted by Kara Hayward and Jared Gilman, Sam and Suzy themselves. We’ll have more, including pictures of the night, and hopefully the acceptance speech, in the coming days. (Above): One of our favorite scenes from MR, based on a true story. Covetous of Sam’s scout badges? Buy your own here! Hat’s off to Boston Sunday Globe for their beautiful full page for the Boston premiere of Moonrise. The clip that started it all: Jason Schwartzman’s audition for Rushmore. britishindie has designed cleverly minimalist posters for each of Wes’ films. Collect them all! Houston Press picked Wes as one of the five film directors they’d like to see direct the Olympics. thisisbooksmusic has a great post about Suzie’s record player. Even fashion icon Victoria Beckham is inspired by Moonrise Kingdom. That’s Suzie’s dress if I’ve ever seen it! If you’re in the mood for some fan art, the official Moonrise Kingdom tumblr has got you covered. Hello hello! Another Friday, another round-up. Many thanks to my compatriots for posting while I was away. This week brought us some exciting revelations regarding Movie #8, aka The Grand Budapest Hotel. We are thrilled, excited, and just beside ourselves with glee over this news and, as you’d expect, we’ll bring you all of the updates as they come. Now, onward! (Above) ANTWRANGLER‘s flickr photostream once again has some excellent behind-the-scenes shots from Moonrise. Film Fashion Junkie’s MR fashion style boards manage to capture the essence of a few key characters. A great round-up of some Wes-inspired posters. Don’t miss the great reinterpretation of the ‘stars’ of Rushmore. 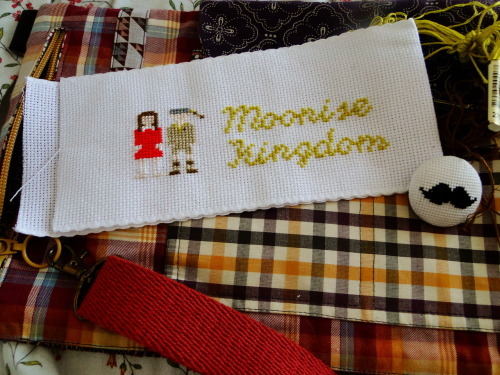 We’re charmed by the Moonrise and Tenenbaums cross stitch projects on amezissou‘s flickr. Aphelis explains the inspiration of French photographer Jacques Henri Lartigue on Rushmore and The Life Aquatic. Bright Wall Dark Room’s Moonrise Kingdom write-up is half-review, half-personal reflection and wholly excellent. Classic(-ish) Interview: Noah Baumbach and Wes Anderson discuss Fantastic Mr. Fox (and many other great things) in this lengthy video from the New York Public Library. The Criterion Collection will be releasing a Blu-Ray Edition of The Royal Tenenbaums in August. Preorder at Amazon.